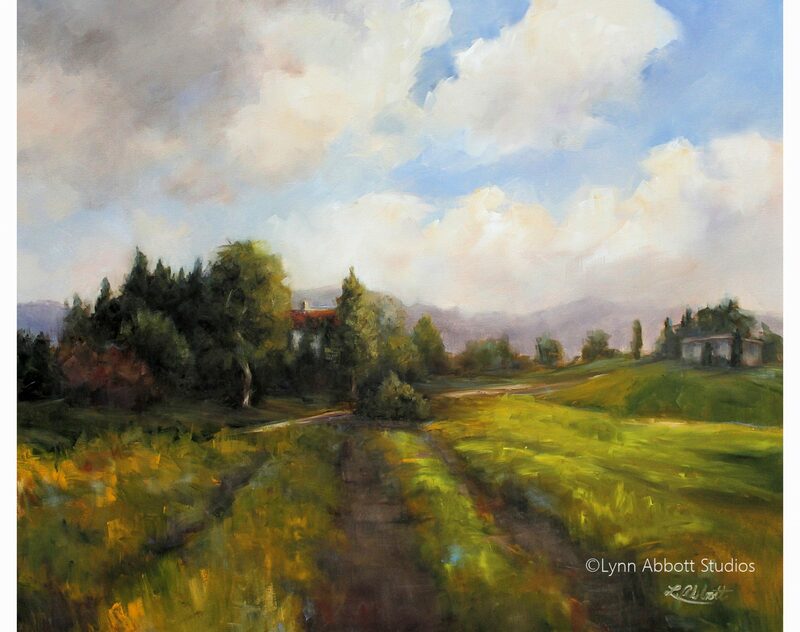 “In the Stillness,” © 2017 Lynn Abbott Studios. Used with Permission. Such traditions delineate picture perfect days. However, like a modern-day Don Quixote, I stubbornly persist. You betcha. My family will attest; I transform into a Holiday Tasmanian devil, spinning wildly as I attempt to recreate every holiday tradition. In short, I attempt to juggle a large number of holiday platters. Quite honestly? I’ve never been particularly good at juggling. One fateful evening, I felt especially rushed. An upcoming deadline for a landscape painting had consumed my time that day, and dinnertime caught me unprepared. Yet, in the spirit of all things Martha Stewart, I threw together a pot of homemade, cream of tomato soup and set it on my gas range. As dinner simmered, I put a few finishing touches on my landscape. I felt confident. After all, with the exception of one multi-tasking mishap (I had absent-mindedly dipped a pigment-filled paintbrush in my teacup instead of my paint bucket), I had escaped my usual disasters. Given the lateness of the hour, I decided to streamline meal preparation and to eliminate one step in my “gourmet” ritual. With cheese grater in hand, I stood tippy-toe over a pot of soup. “It smells as though something is burning,”I added, to no one in particular. As I put the grater down, I discovered the source of the malodorous affront. My baggy, favorite sweatshirt smoldered. Indeed, the flames were growing by the moment. I had no time to consider his wise words. Instead, I madly dashed for the kitchen sink. That’s right. Consumed with frantic activity, my days from November through December nearly go up in flames. In fact, I have learned that the busier I become, the more prayer becomes a necessity… for the sake of my family’s safety. Nevertheless, if truth be told, I must admit that I often put off time with Abba when I get overly focused on my “to-do” list. Thus, the necessity of a good fire-extinguisher in my kitchen. But my Savior teaches a better way… After all, if anyone ever had a massive “to-do” list and limited time, it was Christ. I forget that without Christ’s strength, my human efforts invariably go up in flames. Grace, however, offers another way: a relationship with the Father supersedes and ultimately frees me from platter juggling. Like a weary Elijah, I unload my cares before my loving and compassionate Father. I imagine He smiles tenderly when I echo Elijah, “I have had enough, Lord,” (1 Kings 19:3b). In fact, when Elijah awakened from well-earned sleep after the victory on Mt. Carmel, an angel provided him nourishment. You see, Elijah was not reprimanded for his weariness nor was he scolded for his complaints. Rather, God met him where he was. Instead, a gentle whisper restored Elijah’s weary soul (1 Kings 19:12). And God provided for His prophet, rest and support for the remainder of Elijah’s journey. Yes, in the quiet, Elijah heard Abba’s gentle and compassionate whisper. In the stillness, the child finds God’s gracious plan. For this reason, when tasks and responsibilities overwhelm, I run to the heavenly throne room and climb into Abba’s lap. I give Him my Christmas lists. When I stumble in weariness, He lifts me. He transforms tasks into treasured time. And that is why–no matter what the season–I have found that still moments with my heavenly Father are an absolute necessity. don’t worry about the crisis at hand….just use this moment of possible disaster to chide me for my errant ways…..
and I can’t tell you how many times I’ve dipped a paint brush in my drink rather than my cup of painting water or linseed oil…..
and I drank it anyway…..
and are we on the same page or what—each seeking silence during a season of noise…. Ahhh sorry to hear you set your top on fire! I hope you have a good fire alarm installed?! But very pleased to hear you came away from the incident unscathed 🙂 Thank you for a great post! The guy in the flat below me seems to set off his fire alarm most days, I think he uses it as his kitchen timer! I would laugh if I wasn’t afraid of him burning down the house!! :):) Merry Christmas and Happy Birthday Jesus! Your words ALWAYS hit home for me. Thank you. I like the part about Jesus’s “to do” list! Thank you, Lacy! Isn’t it nice to know that Jesus understands that about our lives, too? Hugs! Thank you, T.R.! My kitchen skills are a bit of a humorous legend in my family 😉 And yes, I’m so grateful that Christ does not overburden me, and that I just need to slow down enough to recognize that! Merry Christmas! ❤ and hugs! 🙂 amen!!! Hugs!!! Merry Christmas! 🙂 Lynn, the to do list is always long, and you are so right…the holidays to do list is huge, making Santa’s naughty-nice list look pale in comparison. I too become way overly task oriented, but you are way ahead for I have not set my self on fire yet! Lol. Love the story, and your art, as always, is beautiful! Ha, ha! I think I have a lot of my friends beat in this area since this is not my first kitchen fiasco! Ha! 😉 Thank you for your wonderful encouragement, Jeff! I respect you and your teaching and writing so very much; thus, your kind words mean a great deal to me. Merry Christmas! Wow! Thank you my friend!! Glad you were not burnt. Your son took this a bit too calmly. Perhaps you need a fireproof apron? Ha, ha! I’m a “menace” in the kitchen! 😉 Thanks for the laugh, Tom! You’re the best. 🙂 Merry Christmas! Always beautifully written! Gosh! It can’t be argued that you have the gift of writing. I love this “Nevertheless, if truth be told, I must admit that I often put off time with Abba when I get overly focused on my “to-do” list.” because it’s so true about me. My alarm bell when i am running on low is that i get really overwhelmed and i get easily irritated. I was feeling this way recently and i quickly went to Abba for a refill as i promised never to underestimate my daily devotion with Him. On another note Lynn, have you thought about writing a novel? I think you will be fab at it. This blog made me feel like i was reading your novel. I think you should pray and see what the Holy Spirit says. Efua, you are such a wonderful and encouraging friend! How can I adequately thank you for such kind words? Thank you and thank you again! Yeah… I was preachin’ to myself here. I’m so glad it resonated with you, too! It’s nice to know that I’m not alone… you are truly a soul sister! Love you! I love when I can be still. I suppose it is only because of His grace. This is really appropriate for this time of year. I also liked the picture. 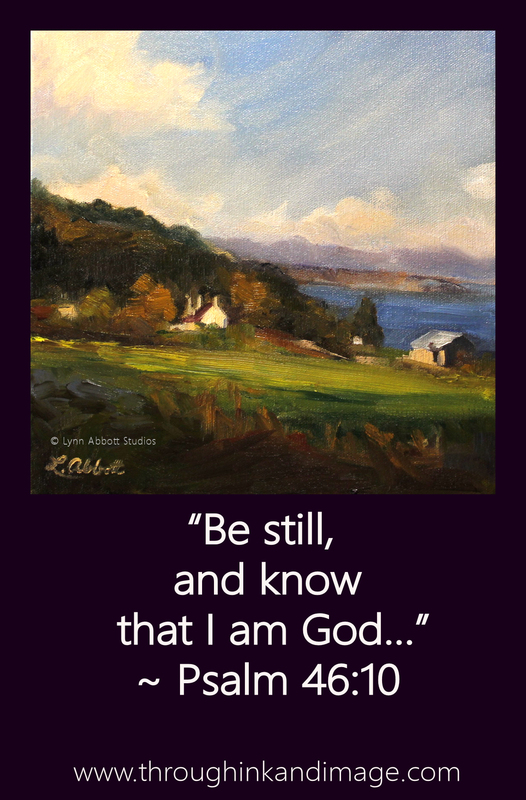 It is a great reminder for me to strive for quiet moments with Him. Me, too, Scott… but it really takes effort for me to carve out time to be still during the busy Christmas season. Sigh. 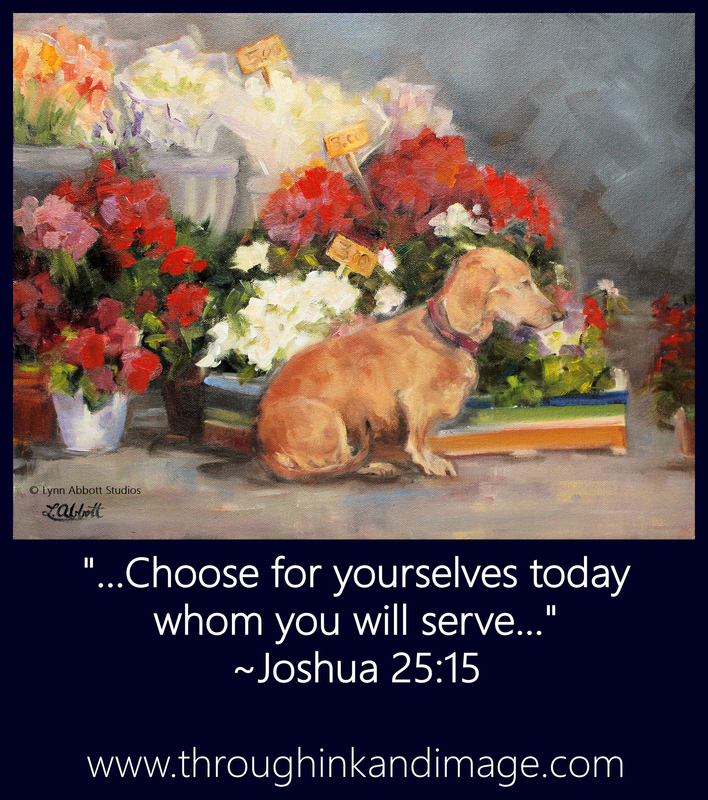 I have to make a conscious decision to follow Jesus’ example. Thank you for your thoughtful words here! It means so much to me. God bless you greatly this Christmas, Scott. I like your painting and your post. Thank you so much, David! God bless you! Really nice post with a great message, but please be careful and don’t put too much of yourself in your cooking (lol). Ha, Ha! Yes… Sweatshirt really doesn’t add anything to tomato soup! Ha! Thank you for your great comment! You made me grin from ear-to-ear! Merry Christmas! Oh, Anthony! Your words encourage me more than you can know. I was feeling tired, a little like Elijah today…but God has sent you to offer your kind encouragement to buoy my spirits. You have truly blessed my soul today! May God bless you greatly for your goodness to me. It’s amazing how that still small voice still shows up, right when we need it most! “He leads me beside the still waters…..
Anthony, you are truly a blessing. Thank you seems so little to say to express the fullness of my heart! But thank you for sharing this. Merry Christmas, my thoughtful friend and brother! Lynn, the feeling is mutual, my dear sister! No words can accurately quantify how amazing it is seeing God be God, and seeing God do what He does! Blessings my sister, blessings. Oh by the way, while reading yesterday, the Lord dropped “live art” into my spirit. Is live art part of your repertoire? Anthony…by “live art” do you mean painting before an audience? 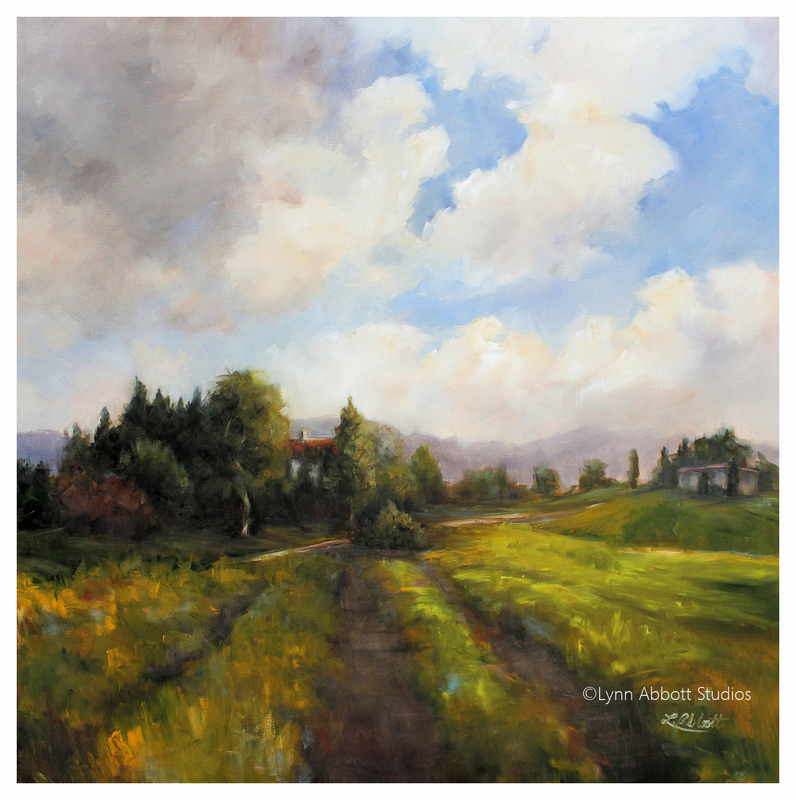 I paint what is called “en plein air” (outdoor and on location painting) and often people stop to ask me questions as I paint. But I have never painted before a worshiping congregation, if that is what you mean. I have a dear friend who does that, however. And yes, God is beyond amazing!! I’m so grateful to Him for allowing me to tag along. 🙂 Merry Christmas, my wonderful brother! I certainly can relate to this post and thank you for sharing it. When we remember to stop, breathe, and rest a moment in God’s presence, we are able to accomplish more in less time than we would have in our stressed out “gotta get it done in a hurry” state of mind. Hi Lynn. 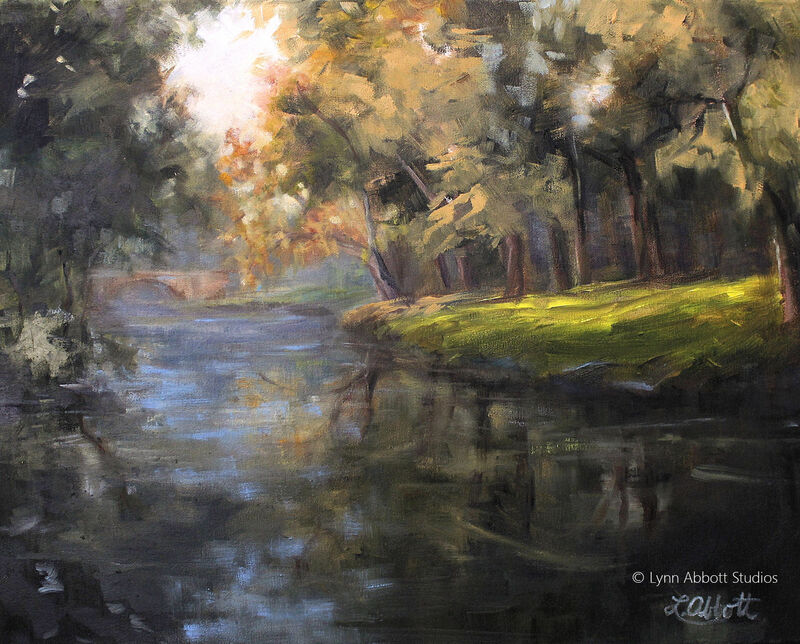 This makes me want to climb into that painting, sit beside that still stream, and listen for “Abba’s gentle and compassionate whisper” and find His “gracious plan.” Thank you for this needed refreshment today. Love and hugs to you! Oh, Trudy… I’ll join you. We can meet Abba there together. 🙂 Love and hugs to you, my dear sister in the Lord! You are such a blessing in my life. God bless you, and Merry Christmas to you and yours! Great counsel here, Lynn. I am a “doer.” I also think that without my constant supervision, the world will cease to function as it should. Giving myself down time is not what I do best and it certainly impacts my closeness with God in a negative way. Thanks for this. Oh, I can so relate! Obviously, I was preaching to myself here! I’m so glad I’m not alone in this, Wally. And so I thank you! God bless you, Wally! And Merry Christmas! I’m so glad! You made mine with your kind words! I LOVE your posts! Practical wisdom, practical examples and practical focus point with a surrounding softness like a favourite sweater. Regardless of the “rolled eye”s you may receive, I’m sure your family loves you with all their hearts for who you are. A delightful child of God! Many blessings! My over six foot son’s favorite comment, as he pats me on the head, is “Funny Mom.” Ha! It’s a term of endearment, I’m sure. 😉 Thank you with all my heart, Bruce. You know that I love your posts! They are life-changing, and I am continually referencing them in my discussions with said son. 🙂 God bless you, my wonderful brother in the Lord. And Merry Christmas to you and your lovely bride! This is really a beautiful post as well as the painting. I love paintings that invite me in to try to catch a fish! Thanks! Thank you with all my heart, Mike! I’m truly honored that you would share this. God bless you, my thoughtful friend! Thankful you weren’t hurt, but what a great seque into your post! I’m so thankful that He is grace to me. And rest. And security. And comfort. Truly our Lord gave us examples all throughout scripture of who He is and who we are to be in Him. I pray He continue to show Himself mighty on your life Lynn! And in the lives of all believers!! God is the eye of our hurricane. I appreciate your transparency and humility, Lynn. So true, Mitch… He’s just waiting for me to hear Him in the quiet! Thank you for your friendship, Mitch. It means so much to me! God bless you, and Merry Christmas! Dearest Dori… I don’t know how you do it… speaking and all the other responsibilities? So very much to juggle. Truly, you are relying on the Holy Spirit because otherwise all of that would be so overwhelming. You are such a wonderful example of a truly godly woman! And yes, you are truly a dear friend and such an encouragement to me! What a blessing blogging has proved to be as it introduced me to you! I have a simple question for you about your speaking plans/schedule… and if you wouldn’t mind, I will email it to the address that WordPress gives me for you. Love and Huge Hugs! Oh, I’m soo glad. But I must say… you are waaaay too young for grandkids! ☺️ Enjoy those busy ones! Of course, I know you will. And no hurry about email. I’ll be happy to hear from you whenever! ❤️ and hugs!! You are hilarious, Oneta! Yes… time is such a factor in this world, isn’t it? No worries. I just enjoy reading your posts. Thanks for taking time out of your incredibly busy day to sit here with me for a while! God bless you big time, Oneta! Hugs! Oh, I can well imagine that your life is crazy! Even if you were only doing half of what you have mentioned on your blog, you’d be super busy. I don’t know how you juggle it all! Truly it must be a God- and grace- thing! 🙂 Prayers for strength and God’s blessing in all that you do in 2018! Huge hugs! A very good message Lynn and very True to Scripture, God Bless you greatly in your Walk with Him and yes He will indeed as we “Commit our way to Him, Trust in Him and wait patiently for Him…..
Make our Righteousness Shine like the Dawn, the Justice of our Cause like the Noonday Sun.